Jupiter transit to Libra 2017 prediction for Libra Sign - Guru peyarchi palangal 2017 for Thula Rasi as per Thirukanitha Panchangam. Let us analyze Guru Peyarchi 2017 prediction in detail for Thula Rasi, so we can know what to expect. The Libra is the 7th house of the zodiac chart. The Nakshatras or stars Chithirai (pada 3 and 4), Swathi and Vishakam (pada 1, 2 and 3) come under this Libra Sign. Those born under any of these Nakshatras will have Libra as their moon sign. Though Lord Jupiter is malefic to your moon sign, depending on His location (which House He currently resides) and His gaze, your benefits will vary. The gaze of Lord Jupiter is said to unlock many good benefits, so the outcome will be good for you. Lord Jupiter had transited to the House of Virgo on August 2, 2016, and resides there. This year, He will transit to the House of Libra on September 2, 2017, and stay there until October 4, 2018. Planet Jupiter will transit to your own House on September 2, this year. This House deals with your personality, your mental strength, and physical health. Your health will be affected frequently. You might have to try many times before succeeding at anything. But, worry not. Lord Jupiter’s aspects is more benevolent than His place of residence. 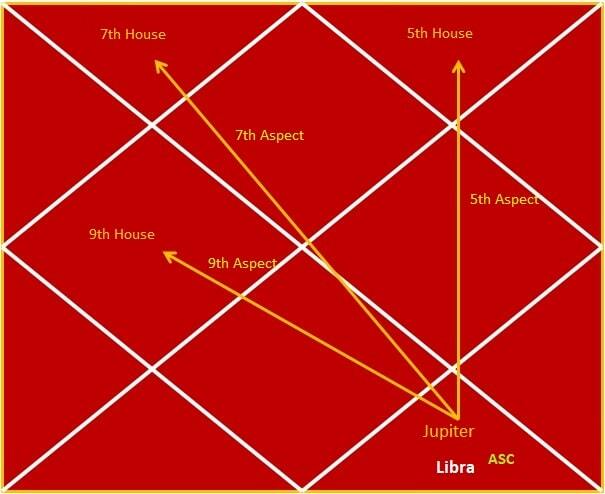 From Libra (Tula Rasi), Jupiter aspects your 5th, 7th, and 9th houses. Therefore, these houses will become auspicious and give positive results. Lord Jupiter aspects your 5th House (House of Aquarius) which is called Poorva Punya Sthanam. The 5th House deals with children. Your children will be successful in their arena of life, be it academics, work, marriage or their own children. Guru (Jupiter) aspects your 7th House (House of Aries) which is called Kalathra Sthanam. The 7th House deals with marital relationships. Those awaiting marriages will get married this year. Some will get married hurriedly. Marital relationships will improve. Those living separately from your spouses will start living together. Jupiter aspects your 9th House (House of Gemini) which is called Bhakya Sthanam. The 9th House is the House of dharma and ancestors. Your devotional and charity work will proceed smoothly. Money flow will be good. This House indicates the well-being of your father too. Your father’s health will improve, along with his wealth and social status. Your father will be supportive. You will receive wealth from your paternal side. Let us have an overview of what this year Jupiter transit has in store for you Libra sign. Students will change their schools or colleges. Those in their own business will change their location of the business. Those working in professional careers will see a change of job or change of location. You might travel to foreign places due to your work. You will start a new business and recover whatever you had lost earlier. Those awaiting marriage or childbirth will have their dreams come true. You will indulge in vacations and pilgrimages. You might even travel to faraway places. So generally, this transit brings in a lot of good outcomes for you.